Any episode that followed last week's mini massacre was going to feel like a slight letdown, and sure enough, this episode was the first of the season to really slow down and spin its wheels a little bit. That's probably not a bad thing, because the audience needs a chance to breathe as much as the characters. It also dealt , at least on the prison side of things, with the kind of "how do we function in this world" kind of issues that the show could do well to address more (like getting formula for the baby, a detail I'm glad the show turned into a plot point), while also handing over some time to watching Rick go insane. Meanwhile, over in Woodbury, Andrea spends ninety percent of the episode continuing to be the dumbest person alive, before finally realizing she's landed in a crazy town and should have left with Michonne (though its debatable if Andrea would have been allowed to leave). Michonne, despite, providing some of the episode's best moments (such as her silent showdown with the Governor), remains problematic. Even in their conversations alone together, we still haven't been given a strong sense of from where her friendship with Andrea is coming. That they've been through a lot together is clear, but there's very little emotional resonance to that, and thus, something that is being sold as a big moment, like Michonne walking out and leaving Andrea behind, plays more like a mild shrug. I really hope the show brings Michonne into the orbit of some other characters soon, because as badass as she is, we don't know enough about the character to care enough to just watch her moving through the zombie-poc alone (especially since we're even less likely to learn anything more about her when she's alone). I like that Rick had absolutely no dialogue in this episode. It added to the creepiness of his breakdown, and was a classic example of "show, don't tell" in terms of his mental state. Speaking of, what was he fishing out of that zombie's belly? Lori's ring? Her *shudder* head? The phone ringing at the end confused me as well. I wasn't sure if it was meant to be some big shocker (like someone is calling from outside the prison), a sign of Rick's insanity (it's not actually ringing), or just Glen or someone guessing where he is and calling from another part of the prison. I'm sure next episode will make it more clear, but as a cliffhanger, it was probably too confusing to be effective (or maybe I'm just overthinking it). Poor T-Dog. We learned more about him via the conversation between Hershel and Glen (which was great, albeit troubling) than we ever knew when he was alive. Loved that Daryl had no hesitation when it came to going out to find formula. The following scene between Glen and Maggie was also nice (especially for Glen not freaking out), as was Carl listing the names of all the deceased women who could give their name to his sister. I'd forgotten about a fair amount of them; good to know that Carl hasn't (that said, I hope the baby's name remains "Asskicker"). So the Governor is keeping his zombie daughter alive, making him something of a more insane Hershel from last season, with greater resources. Presumably "Penny" is the daugther, though I'm not sure what all the hashes in the notebook represent. He's also giving Woodbury entertainment in the form of MMA-style fights where zombies are the cages, which is the thing that finally makes Andrea see how wrong the place is. It also raises an interesting idea: Andrea is right that they shouldn't be making people take the Walkers less seriously, but at the same time, the Governor has a point that people can't live in constant fear. That said, I side with Andrea, and feel like the time for fearless complacency can come when the community is bigger and the zombie problem more under control. Mrs. Teebore pointed out that Andrea also had a blind spot when it came to Shane last season; maybe she's not dumb so much as easily hoodwinked by a big strong mayun (which is probably worse for her character). I'm curious about whatever experiment Dr. NotJohnRitter wants to carry out. Nitpick time: Country Prisoner and New T-Dog (thanks, Dr. Bitz!) mentioned spacing out the Walkers along the fence to keep them from bunching up; I ask again: why aren't they just killing them through the fence? A. I thought they didn't want to bury anything in the yard? B. What, exactly, was he planning on burying? C. I've said it before, but I'll keep saying it: adhering to tradition when it comes to the burial of the dead in any kind of high risk/apocalyptic situation is beyond dumb. I assume Rick and the phone is going to be the same as it was in the comics. It wwasn't my favorite plot point. That said, the phone rining and Rick's croaked "hello?" was suitably creepy. Michonne hasn't been as strong a character on the show, but her zombie slaughter was cool. that said, I was expecting more from her walking out. Maybe we'll see some repercussions next episode? The grave-digging was odd. Also, whose grave did Daryl visit? Was it Sophia's? I think my attention slipped for a second; I thought the baby had died, and this was the show's attempt at being arty. I liked the opossum scene and Maggie's rejoinder. I'm glad we didn't have to suffer through zombie toddlers. Despite the rough patches, I'm glad this season's still moving faster than the last. @Mike: That said, the phone rining and Rick's croaked "hello?" was suitably creepy. My confusion/wondering aside, it was really creepy. It's amazing how creepy, in stories like these, the sudden appearance of the mundane cane be. Also, whose grave did Daryl visit? I took it to be Carol's, though as with T-Dog and Lori's presumed graves, I'm curious what was buried that required the digging of such deep graves (if they wanted to erect ceremonial head stones, fine, but why dig a hole for nothing?). And, of course, I'm not convinced Carol's dead, though I'm uncertain where she'd be at this point if she was alive. I'm glad we didn't have to suffer through zombie toddlers. Absolutely. The show is far from perfect, but this is without a doubt the best consecutive five episode stretch the show has ever had. Not your analysis, Teebore — great as usual — but, of course, the Governor's father/daughter time. Rick's disturbed haze was, well, disturbing too. I didn't get the sense that Rick was looking for (or had found) anything particular in that zombie's belly. The belly did look particularly distended, but I just took that to be an ironic, painful reminder to Rick of Lori's pregnancy, and his fishing around in there was a grotesque, cathartic reenactment of the delivery that he was absent for. Now that you ask, though, I can totally see it as him actively getting something. The last option of the phone-ringing that you present, Glen calling, is one that I hadn't even considered. How we saw Rick's catatonic — you might almost say "zombie-like" — state was right on the border of realistic and surrealistic in terms of how it presented to us; I'd be more inclined to think that the ringing was imagined if it was presented just a smidgen more altered-state than it was. As it stands I take it as having really happened, breaking Rick's stupor, as evidenced perhaps by the fact that he did finally speak when picking up the receiver. I think you're right, though, that it was too confusing to be effective; in fact, I found that it broke the tension of his scenes exactly the wrong way, almost humorously because of its absurdity. I'm not sure what all the hashes in the notebook represent. The obvious guesses seem to me to be either people lost or days since the outbreak, but I didn't care to figure out the math as to which was more likely. Right now I'm leaning towards "Can two female zombies live platonically with one male zombie without having to convince the landlord that the male zombie is gay?" What, exactly, was he planning on burying? I couldn't come up with any answer other than Lori, T-Dog, and Carol, which is both pessimistic in terms of thinking that Carol's dead but even more ridiculously optimistic in terms of thinking that (a) there's enough left of T-Dog in particular to properly bury — Wouldn't he have become a walker anyway? — and (b) that the group could possibly emotionally withstand dragging either of them, particularly Lori, out from where they died all the way into the yard. I loved the little flick of blood off the sword that Michonne did after making her way through the zombies/walkers/biters that she released. Details! 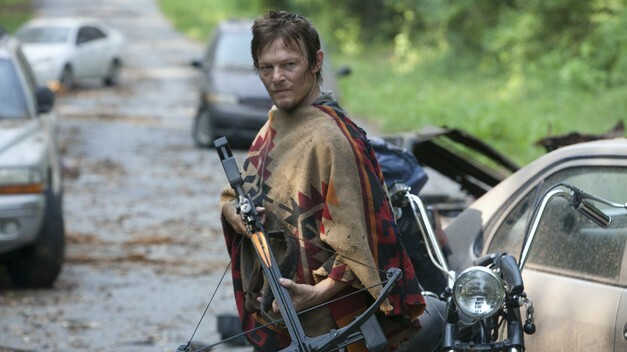 Daryl's poncho and the fact that he thinks he looks cool in it are still awesome. I feel like we've mentioned this before, but crosses seem a little uncomfortably ironic given the circumstances. I appreciated the slightest linger on the name "Sophie" on the board in the classroom as Daryl scanned it. The fact that the name wasn't an exact match for Sophia's made it all the more understatedly poignant. The compare-and-contrast between Woodbury and the prison (and "outside") is really intriguing. My big question is whether Rick is going a little crazy due to heightened emotions or adrenaline or whatever like Shane did and whether that will become a permanent reliability. I remember just enough, and just little enough, of what we found out about that aspect of having the walker virus in one's system from the end of last season to frustrate me. Are we supposed to be making the connection to Shane? Is Rick's tendency to hack and slash his way through walkers without protection coming back to, literally, haunt him? How much of what Shane went through was due to the scratches out at that place they were gonna deliver Captive Kid and how much was due to the dormant (or not-so-dormant) virus that virtually everybody apparently now carries? The only Dead recaps I read are here and, theoretically at least, at Nikki's (but I fall behind), and every week when I spot something that seems laden with import that you don't mention or that I'd interpreted very differently I get the itch to search for more. I'm set in my ways, and I resist the temptation both because doing so is extra work and because I fear getting sucked into a whole new habit if I do find something good. If you have recommendations, though, I'm happy to hear them. @Mike: I'm glad we didn't have to suffer through zombie toddlers. I really and truly thought that we could be headed there with Lori's pregnancy, right up to her starting to bleed in the boiler room pointing to perhaps a (not-so-)stillbirth. A gurgling walker baby could easily have been a "jump the shark" moment, however, even as good as the effects are on this show. Had it been really convincing, well, I still get the shivers flashing back to the lizard-baby delivery on V some 30 years ago so I'm one part curious to at least one part "No thanks!" You're both right on about this stretch being the most satisfying the show has been. @Blam: I didn't get the sense that Rick was looking for (or had found) anything particular in that zombie's belly. Yeah, that's the general impression I've got from most people I've read/talked to about it. Ha! "Come and knock on our door..."
Indeed. I meant to comment on that as well. The fact that the name wasn't an exact match for Sophia's made it all the more understatedly poignant. I liked that as well. If you have recommendations, though, I'm happy to hear them. I barely have time to keep up with this blog, let alone the half dozen or so other blogs I do genuinely want to keep up with (like yours and Nikki's) so I don't venture off my beaten path nearly as much as I did during, say, Lost, when I checked in on dozens of different sites. TV-wise, other than Nikki's blog, the two places I go most frequently are the Onion AV Club and Alan Sepinwall's blog, but those are both more traditional "online critic" style sites (they have comment sections, but I tend to avoid them because they're large and unwieldy and contain the kind of random stupidity that comes with large, unwieldy comment sections on heavily trafficked sites, if you know what I mean. Plus, I definitely wouldn't have the time or energy to keep up with them).